Making homemade ice cream with milk, sugar, and fresh blackberries and boysenberries. The dog days of August and September are here. What better way to endure than with ice cream? It is so easy to make at home, and a great way to use locally grown fruits and nuts from the farmers market or your garden. I’ve been experimenting with varieties: Meyer lemon, mulberry, blackberry, peach and nectarine, pistachio, chocolate. The first time I tasted gelato was in Florence, Italy. That “ice cream” was a revelation. Why did the fruit in a strawberry gelato taste so different than the strawberry ice cream at home? Over the next several days, every one of those Florentine gelatos I tasted, as well as the sorbetti (sorbets), was intensely flavored. 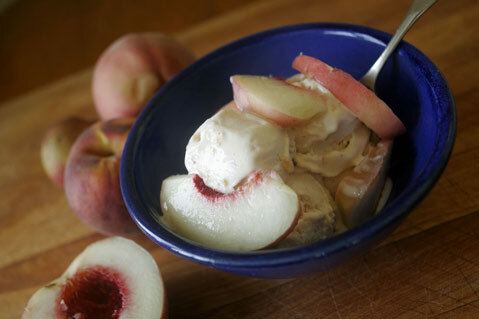 Homemade ice cream made using fresh peaches and nectarines. It’s summer, so let’s give our luscious produce a chance to show-off. Macerating the fruit with the sugar first insures tender fruit in the finished product. Stir together the chopped fruit and sugar, and chill for 8 hours or overnight. Combine the fruit mixture with half-and-half and vanilla; as long as the half-and-half is also very cold, you can freeze mixture immediately in your ice cream maker, according to directions. Adding the egg white to this sorbetto increases the volume and makes it fluffier, like orange snow. Light and refreshing. To juice oranges, cut in half evenly, and squeeze oranges on a hand juicer until all juice and most of the pulp is extracted and reserved. You will also be reserving the orange peels, so be careful to keep them intact. If there is a little pulp in the peels, scrape this out carefully with a spoon or melon baller and add to the juice until you have 3 cups. 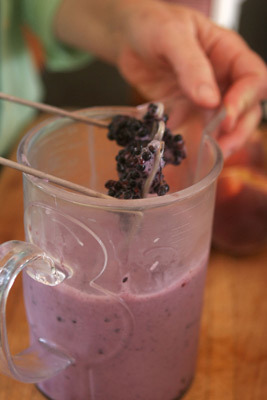 Place juice and orange pulp, water, sugar, orange zest, and Cointreau in a blender; blend until smooth. Chill mixture for 2 hours or until very cold. 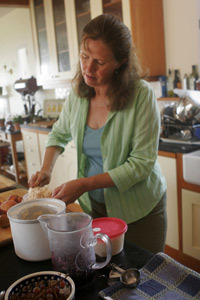 Place mixture in ice cream freezer, and freeze according to manufacturer’s directions. About halfway through the freezing, as mixture is beginning to set up, pour in the egg white (you will need to stop the machine for a minute and make sure egg white is stirred in). Continue freezing as directed. When finished, pack sorbet into orange shells and serve, or place in freezer for later use. You will have extra sorbet for a separate container. If not serving right away, let sorbet sit out of the freezer about 5-10 minutes to soften slightly before serving. This is so good made with fresh pistachios. Use shelled raw pistachios for this recipe. Adding the ground nutmeats to the heated milk really brings out the flavor. In a food processor or coffee grinder, grind the pistachios to a fine powder (or grind the nuts with a rotary grinder, such as Zyliss, using the finest grater). In a medium saucepan, combine the milk and sugar. Cook over medium heat, stirring until the sugar is dissolved and bubbles form around the edges of the pan. Remove from heat, add the ground pistachios, cool, cover, and refrigerate overnight. For a smooth texture, you may strain the milk mixture through a fine-meshed sieve, pressing on the nuts with the back of a large spoon to get as much liquid from them as possible, and discarding the nut pulp after pressing. But if you like it a little nuttier, as I do, skip this step. Transfer to an ice cream maker and freeze according to manufacturer’s instructions.